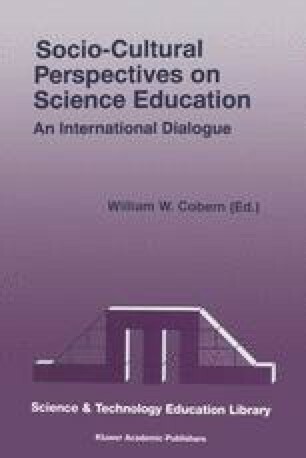 Our experiences as teachers and educational researchers indicate a general enthusiasm amongst science teachers for constructivist-based teaching practices aimed at improving the quality of student learning. However, even when teachers believe that constructivism is an appropriate epistemology (or way of knowing), they struggle to implement and maintain teaching practices informed by constructivist theory (Taylor, 1996; Tobin, Davis, Shaw & Jakubowski, 1991; Vance & Miller, 1995). We believe that the difficulties experienced by science teachers in instituting constructivist-inspired changes in their classrooms can be explained, in large part, if school science is viewed as a cultural activity which is constrained by powerful and ubiquitous cultural myths.